We are extremely sad to announce that Eastlake High School is no longer going to allow us to rent classroom space for teen education. SO…. We are currently building out a new space at 701 228th Ave NE, right next to Subway! We will be able to offer evening and weekend courses as well as adult lessons and testing for DOL! It looks like we are on track to open in late April 2019. Please see the teen tab below for our first courses! Looking for the best driving school in Sammamish? You have several choices, but SWERVE Driving School is your best choice. 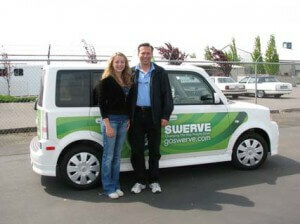 What makes SWERVE Driving school the best choice for drivers education in Sammamish? SWERVE Driving School’s curriculum content and support materials are current and lively. Classroom material is organized so that it supports what teens are learning behind the wheel.SWERVE Driving School’s instructors teach Sammamish students to be safe and responsible drivers in a fun and supportive environment. Are you ready to get your license and become a great driver? SWERVE Driving School is your best choice for driving school in Sammamish or in a variety of Seattle area driving school locations. Simply enroll with SWERVE today by registering below or give us a call at (425) 881-6800. 1 WA State Road Test - Your Vehicle or no additional charge to use a Swerve Vehicle. Road Testing available at Klahanie and Woodinville locations.